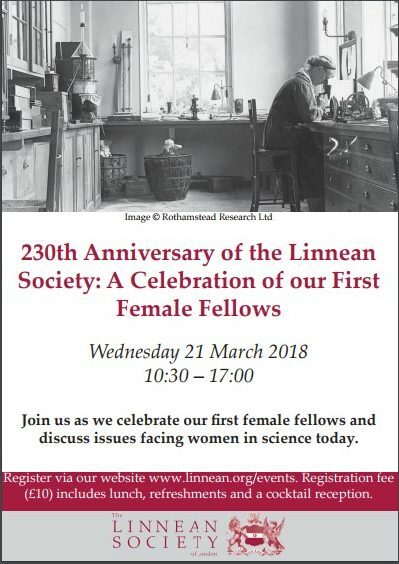 Just over 100 years ago, the Linnean Society admitted 15 ground-breaking Fellows – all women. To coincide with its 230th anniversary, the Society will be celebrating the first female Fellows and their contributions. This one-day event will look at these women in detail, while also exploring issues facing women today like imposter syndrome and the work/life balance of women in the field. Short talks, discussions and activities will address these issues and encourage solutions; Dr Sandy Knapp, President-Elect (only the third female President in the Society’s history), will chair the sessions. The event will conclude with cocktails inspired by these outstanding first female Fellows. Speakers to include Professor Athene Donald DBE FRS (keynote), Dr Maria Vorontsova FLS, Dr Rich Boden FLS, Dr Erica McAlister and Dr Emily Grossman.